Peter Konwerski, the vice provost and dean of student affairs, said the University has demonstrated its commitment to the student experience and increased retention by raising $177 million for financial aid, facilities upgrades, career support and more student services and programs. When it comes to improving graduation rates, a new report found that funneling money into student and academic support is more effective than lowering tuition. The study, published last month by the National Bureau of Economic Research, found that students are not any more likely to graduate from a university if tuition is lowered, but money spent on tutoring services and shrinking class sizes does help more students get a diploma. At a time when officials are slashing administrative positions to reduce spending and seeking to improve student retention, the report’s conclusions find a potential clash between those major aims. The study, authored by Harvard University education professor David Deming and Christopher Walters, an economist at the University of California – Berkeley, used data from the Department of Education and examined state funding dollars and graduation rates to reach their conclusion. Vice Provost and Dean of Student Affairs Peter Konwerski said the University has demonstrated its commitment to the student experience and increasing retention by raising $177 million for financial aid, facilities upgrades, career support and more student services and programs during the $1 billion fundraising campaign, which reached its goal in May. 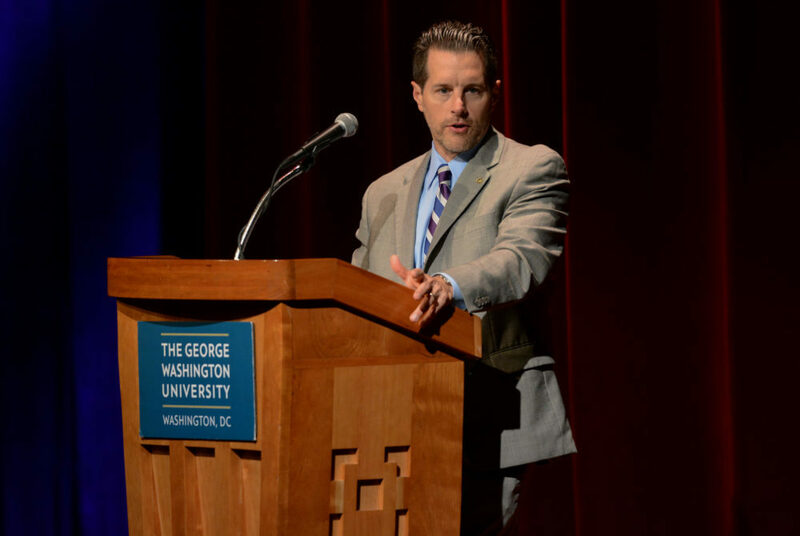 “Helping students be successful both inside and outside the classroom is the hallmark of a GW education and the reason why we remain focused on student retention and the student experience,” he said. Improving student retention has been a central goal of top officials, and University President Thomas LeBlanc has already made it one of his priorities. Last spring, officials announced the formation of a faculty advisory group to improve retention rates and hired Oliver Street, the first executive director of enrollment retention, the previous summer to look specifically at increasing retention. The University has historically had a low six-year graduation rate when compared to its peer schools, and officials said they expected five-year graduation rates to sink below 80 percent for students who enrolled in 2011. GW’s most recent four-year graduation rate is 70.9 percent, according to institutional statistics. At the same time, the University has faced a budget crunch. Former University President Steven Knapp announced in 2015 that all central administrative units would have to cut budgets 3 to 5 percent over the next five years – the latest in a series of cuts following a drop in the University’s graduate enrollment. These cuts led to layoffs in GW’s libraries, technology and student affairs. But Deming and Walters – who analyzed how government money should be spent at public universities – found GW may have an advantage over public universities because it can fall back on its endowment during financial stress, while public universities often face the brunt of state budget shocks. The University’s endowment measured about $1.57 billion during the 2015-16 fiscal year. Its approved budget for the fiscal year 2018 forecasts spending of more than $36,000 per student, if the total expenditures are divided by the total number of students at GW. Peer school New York University spends about $60,000 per student and has an 82 percent four-year graduation rate, while American University – another peer institution – spends about $48,000 and has a 76 percent four-year graduation rate, according to Department of Education statistics. Tatiana Melguizo, an associate professor of education at the University of Southern California and an expert on college graduation rates, said even if officials dedicate more resources to helping students graduate, often graduation rates are determined by the students who opt to go to a university. GW’s admit rate has increased in recent years, reaching a 10-year high of 45 percent in 2015 before it decreased to about 40 percent last spring – still about 10 percentage points higher than 2013. Melguizo said some types of spending could be more beneficial than others. New labs and buildings may be able to attract new students, but they are unlikely to help students graduate, she said. There have been several major construction projects in recent years, including the $275 million Science and Engineering Hall and the $130 million District House. Colin Riley, the executive director of Boston University’s media relations office, said that every component of a university should be geared toward increasing graduation rates.